Whether you're serving drinks or food, displaying family photos or adding elegant storage to your dining room or living room, the Amish Queen Anne Hunt Board comes dressed to impress. 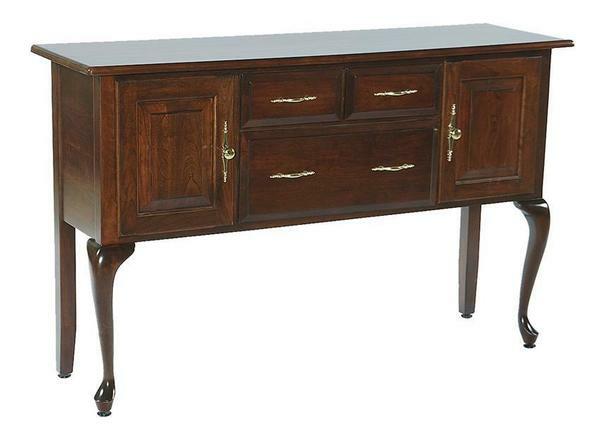 With the gentle curves and grace of formal style furniture, this solid wood hunt board stows and styles effortlessly. Handcrafted compartments supported by cabriole legs hold your treasures securely. You've found the classic Queen Anne look for your dining room. Even better, you can customize this hunt board with the look you want. Each drawer will perform with dovetailed drawers providing strength along with drawer slides that are a joy to use. Click on your custom options on the Select Options page or get in touch with personal service provided by one of our Amish Furniture Specialists. We encourage you to have some fun ordering wood and finish samples to inspect at home as you decide on the look for your new Queen Anne Hunt Board. Your new custom furniture comes home to you built to match your vision. We can't wait for you to enjoy the finished product for decades! We thank you for shopping with DutchCrafters, the #1 online retailer of Amish furniture--solid wood furniture that becomes part of your story.